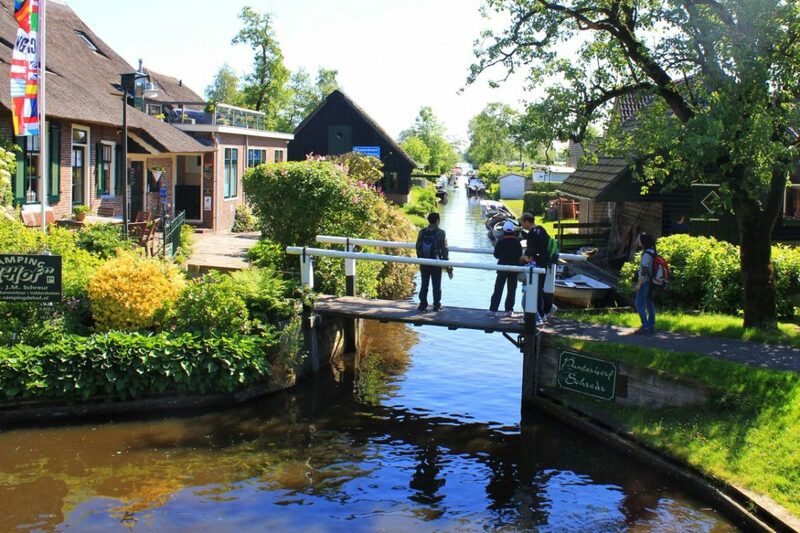 The charming village of Giethoorn consists only of waterways and narrow walking paths. It is fittingly called the ‘Venice of the Netherlands’ or the ‘Venice of the North’. I had the opportunity to visit Giethoorn twice in the last few months. Canals in Giethoorn. 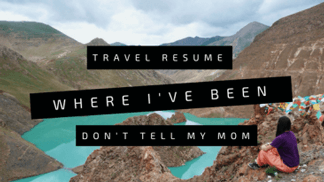 ©Bunch of Backpackers. Walking around in Giethoorn gives you a serene village-feeling. You hear birds chirping, a boat slowly passes you by and an elderly resident greets you. Giethoorn is a true oasis of peace and quiet. 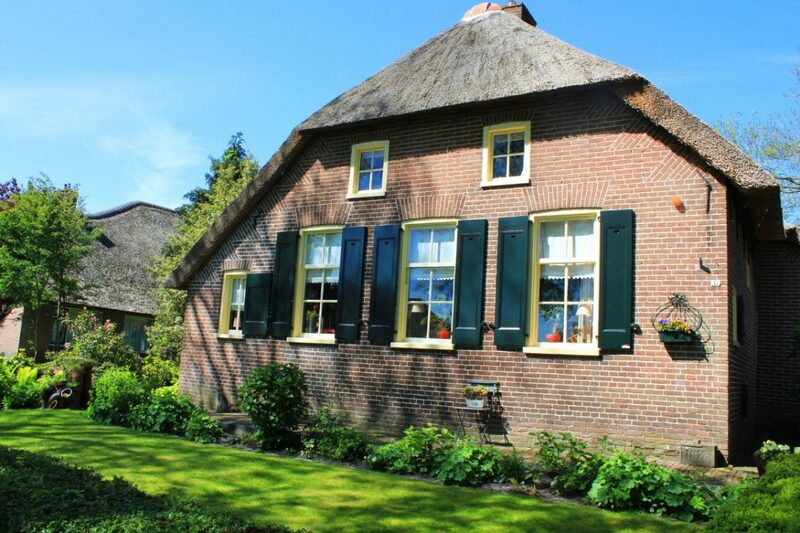 You pass by classic 18th century Dutch-style houses and farms with thatched roofs. Each of these well-preserved houses comes with beautifully kept gardens. 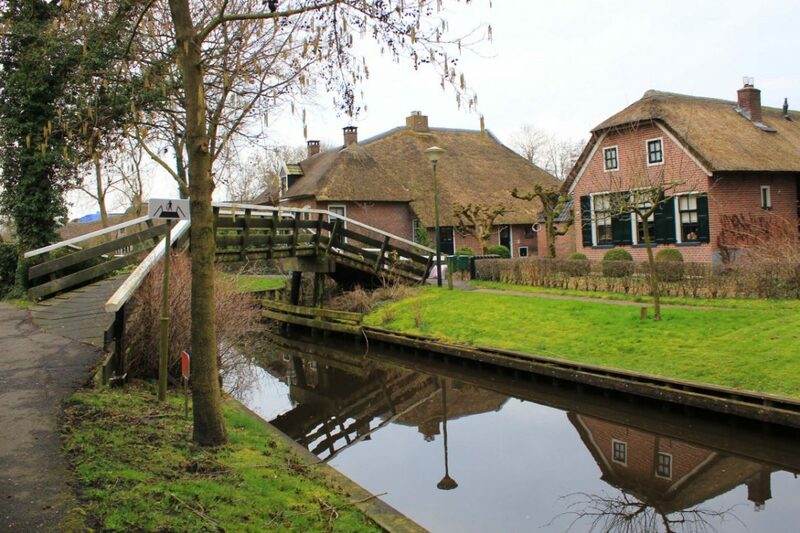 There is no motorized traffic allowed in the old part of Giethoorn and the houses can only be reached by crossing one of the high wooden bridges. 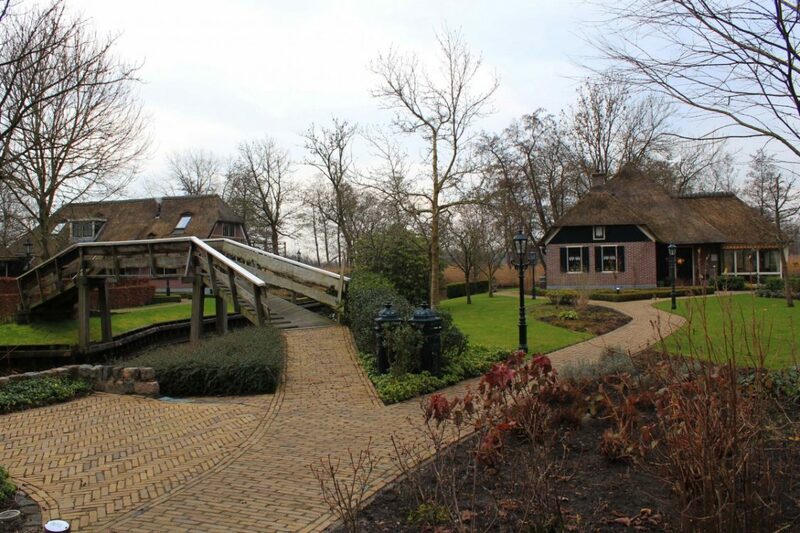 There are more than 150 steep bridges in Giethoorn connecting the houses and the main walking path which lies parallel to the canal. 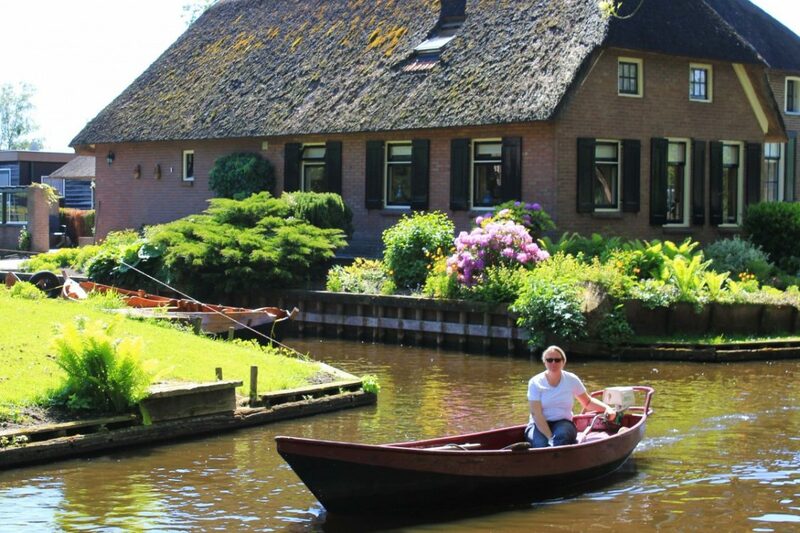 A fun way and authentic way to explore Giethoorn is by boat. 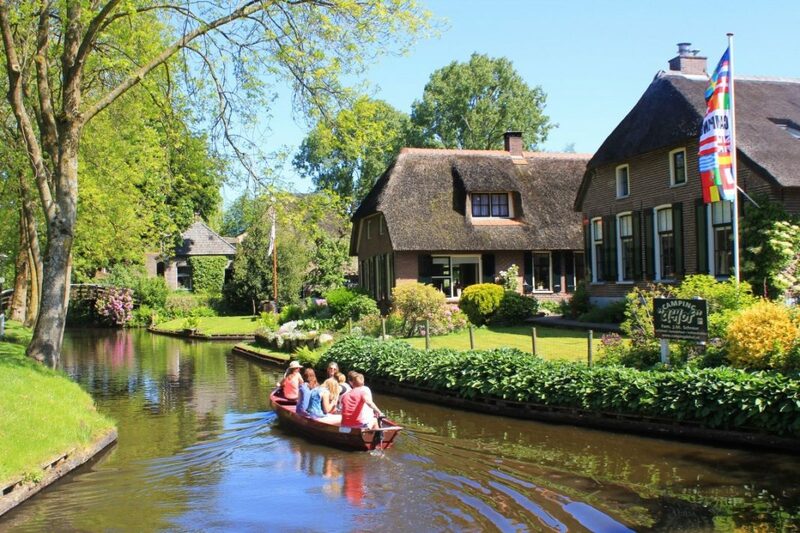 By boat you not only have the chance to see Giethoorn from the water, but also to explore Giethoorn’s pretty lakes with birds, ducks and more nature. In the evening you can go for a moonlight cruise. It’s absolutely beautiful to see charming Giethoorn by nightfall. Giethoorn house. ©Bunch of Backpackers. Villager in Giethoorn. ©Bunch of Backpackers. Giethoorn village. ©Bunch of Backpackers. Giethoorn in the evening. ©Bunch of Backpackers. What to do in Giethoorn? A must-do in Giethoorn is to rent a boat. You can rent your own boat or hire a boat with a captain. 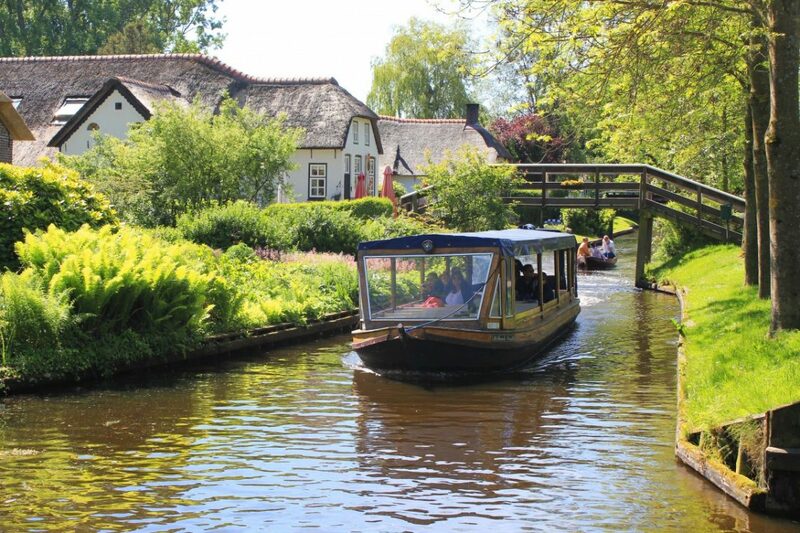 This is by far the best way to explore Giethoorn. There are several boat rental options and there also different kinds of boats. You can rent a boat with an electronic motor, a canoe paddling boat, a ‘whisper boat’ or a punter. It is also possible to do a guided trip with a large boat or an evening canal cruise. For the more sporty types, Giethoorn offers the possibility for ‘suppen’ which is stand up paddle boarding. Another option is to explore Giethoorn by bike. There are several bike rental companies in Giethoorn. 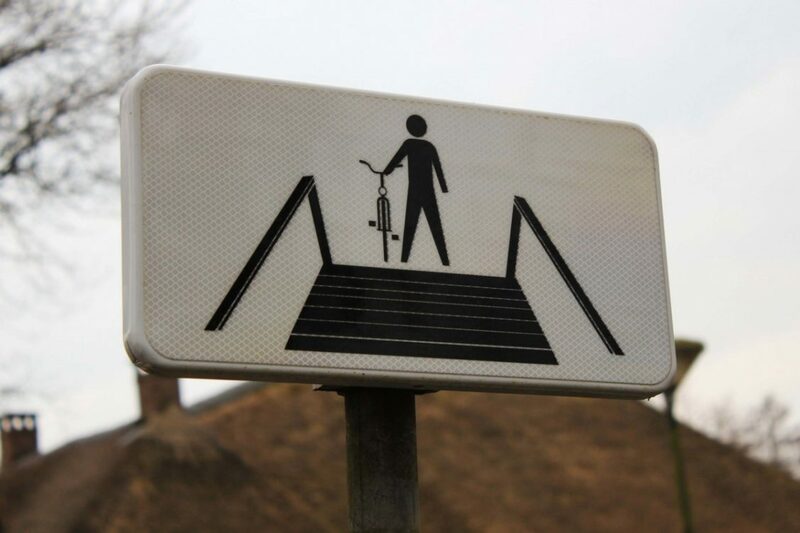 When cycling, beware for the steep bridges. It’s better to walk up the bridge ;). In Giethoorn, you can also visit the two museums ‘Het Olde Maat Uus‘ which is a typical farmhouse and ‘De Oude Aarde‘ (The Old Earth). During my visit to Giethoorn, it was low-season and we saw few other tourists. 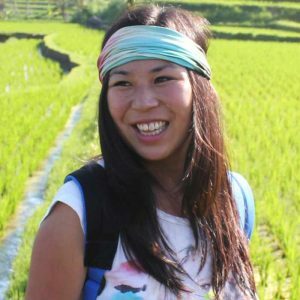 However, it can get really busy in high-season, so make sure to book a room and maybe even a boat beforehand. Be careful on the steep bridges in Giethoorn. ©Bunch of Backpackers. 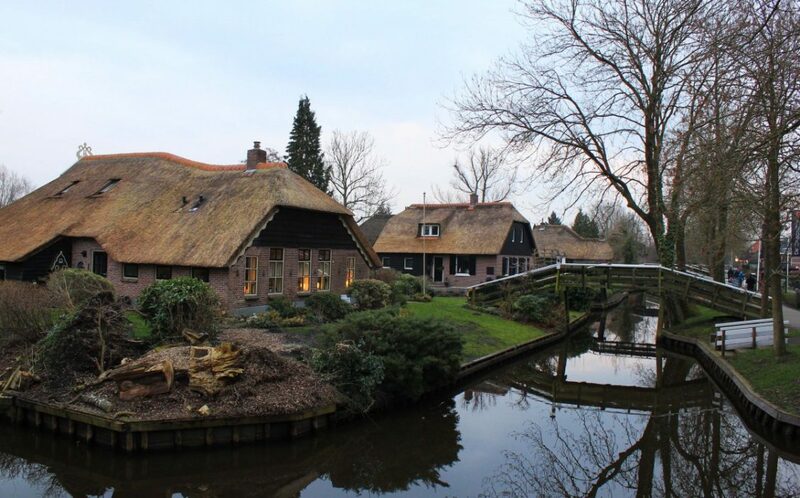 Where to stay in Giethoorn? 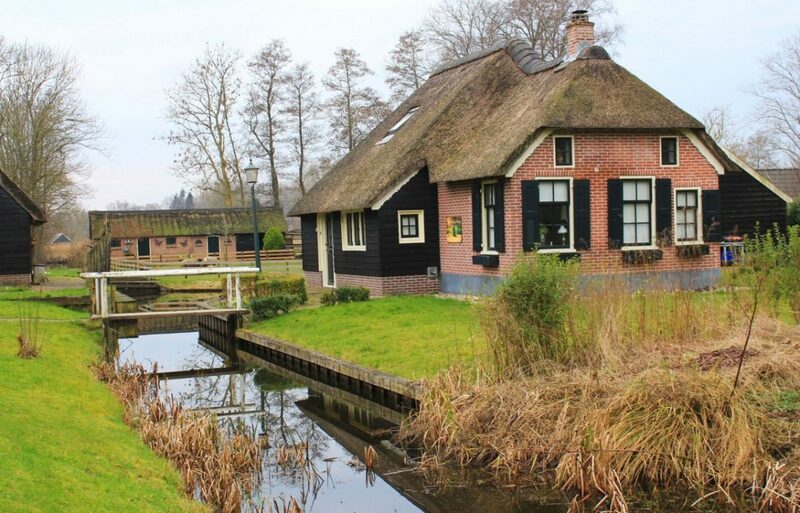 There are numerous accommodation possibilities in Giethoorn. Unfortunately there are no hostels and cheap options for backpackers in Giethoorn. ‘T Zwaantje offers a 3-person room, which will set you back at a reasonable 99 euro’s. 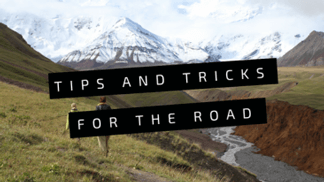 There are also some B&B options and a camping. 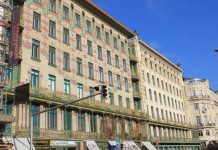 We stayed at Hotel de Harmonie. This hotel is located in the southern (more quiet part) and is recommended. Pathways in the village of Giethoorn. ©Bunch of Backpackers. Where to eat in Giethoorn? 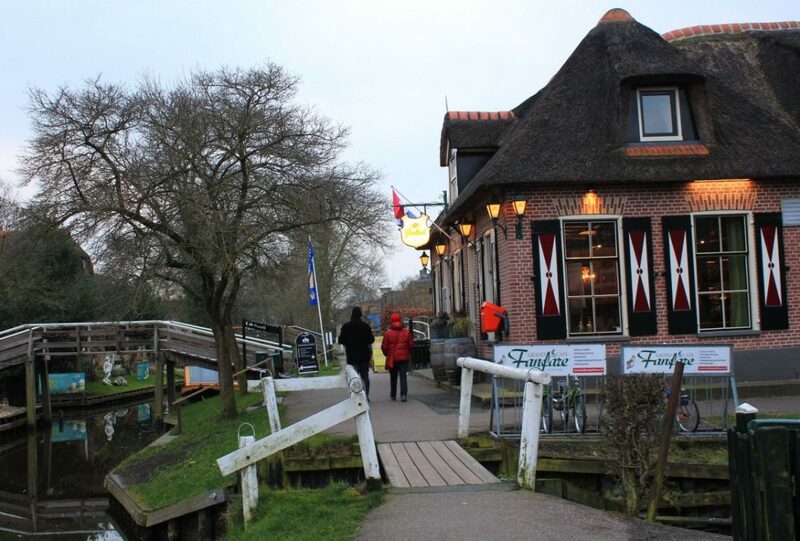 The most famous cafe and restaurant in Giethoorn is ‘The Fanfare’. It became famous after a Dutch movie was partly shot there. 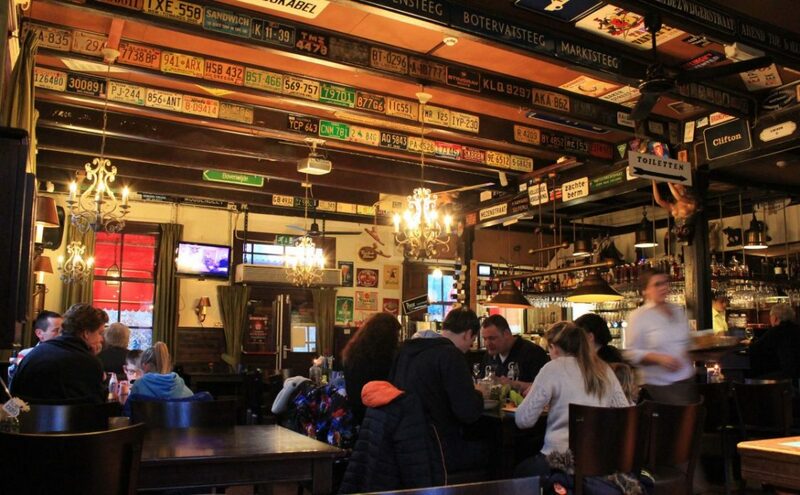 In Giethoorn there is also a pizzeria, a Dutch pancake house and some other restaurants. You can also get your own dinner at the supermarket ‘The Spar’. As you may have already guessed, there are no clubs or bars. How to get to Giethoorn? Giethoorn is one of the towns in the Netherlands which are worth a visit! You can reach Giethoorn by public transportation. From Rotterdam to Giethoorn by train and bus, it will take around 3 hours. From Amsterdam to Giethoorn by train and bus, it will take around 2,5 hours. There are also organized tours leaving from Amsterdam. Check out the Dutch official website 9292.nl on how to get to Giethoorn by public transportation. Would you visit Giethoorn during your stay in the Netherlands? 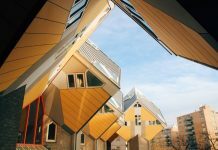 The Ultimate Guide to Hostels in Rotterdam – 5 hostels tried & tested! 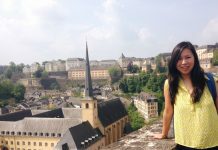 One day in Luxembourg City itinerary: What to do? 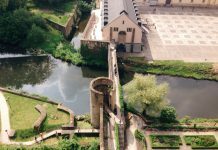 8 Reasons why Luxembourg should not be missed during your Europe trip! 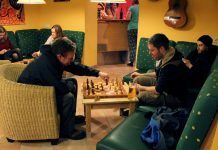 17 Reasons why Hostel Ruthensteiner in Vienna rocks! I LOVE Giethoorn. It is such a peaceful village. If you haven’t been to the museum yet, I would highly recommend it! Hi Jess! Thanks reading! How did you visit Giethoorn? By public transportation? Was it okay? For us Dutchies it’s easy, but I can imagine it’s more difficult for the non-Dutch! I live in US, i am retired and i would like to visit Giethoorn with my granddaughter. How do i plan to stay for two to three days there? Would it be fun for a child staying there? What kind of activities going on around the village? Giethoorn ziet er prachtig uit! Ik ben er heel lang geleden met mijn oma geweest (die vond dat mijn broertje en ik meer van Nederland moesten zien), maar zo te zien verdient het een herhaalbezoekje! How cute is this village?? We seriously need to see more of the Netherlands. Got to start planning… :-) Great pictures by the way! Hi Irene, Thanks! Yeah, there are definitely much to explore in the Netherlands. We will try to do some more Netherlands posts soon :)! I’ve added Giethoorn to my list of “car-free” towns. I’m always looking for those. Will try to check it out next time I’m in the Netherlands! Hi Marie-France, car-free towns are the best. Which other car-free towns do you know :)? Wow, Giethoorn sounds like my kind of place! You had me at the words ‘no motorized traffic’. I am glad such places exist even today. 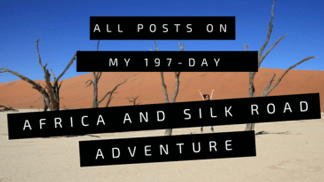 I’d love to visit some day, thanks for sharing. Thanks Natasha!Hope you will visit soon :)! This looks amazing! I would love to go here. The only other place I knew about without roads before this was Venice! I’m sure you will love it Christine! The Netherlands were devastated in the War, but it’s just incredible how they’ve recovered. It’s such a civilized, well-put together country, everything is so well maintained and manicured, just look at these pictures. So many people only see Amsterdam, but there’s so much more to the country. Thank you Milosz, there is indeed so much to see in the Netherlands! There are many pretty villages like Giethoorn! Thank you Lorrie! It’s gorgeous! Yes, I would definitely! The idea of renting a boat and visiting a town like that is simply marvelous! It’s a perfect destination for a day trip from Amsterdam! Love it! Thanks for sharing! It is, isn’t it :)? Dutch spring and summer I’d say Erica! Hi, how good is the Histomobil Museum? Has anyone been there? 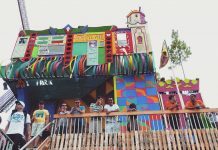 I am planning to go there next week and my boyfriend might enjoy it. Thanks! Thanks for the review. I plan to visit Giethoorn in September. Is it a good time to be there? Yea, I reckon it’s going to be a bit difficult for me to go there on our own. I didn’t know it’s quite far from Amsterdam. Thanks again. Let me know anymore tips or advice of the trip to Giethoorn. – The locals are more than happy to have you in their town, but they also live there, so if you want to make a picture in their garden( believe me you’ll want to), please just ask. -If you like having skin on your hands keep them in the boat when traveling through the town itself. -Most boat rentals only accept cash, and the boats range from 15 to 25 euro per hour. Fyi. -On busy days there will be traffic jams on the water, as nice and polite as Chinese are, they can’t operate boats at all. All and all Giethoorn is a marvelous place but there are some downsides to the rye paradise.